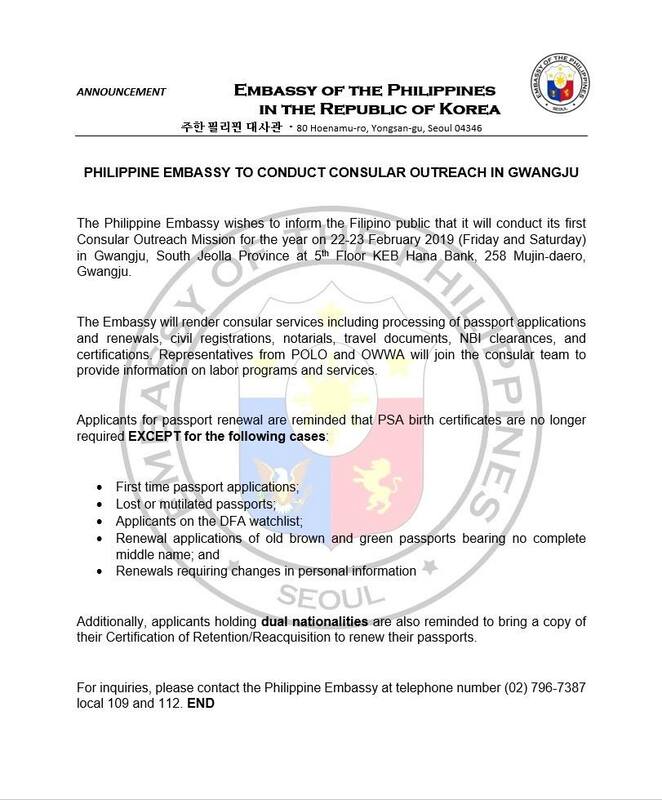 The Philippine Embassy wishes to inform the Filipino public that it will conduct its first Consular Outreach Mission for the year on 22-23 February 2019 (Friday and Saturday) in Gwangju, South Jeolla Province at 5th Floor KEB Hana Bank, 258 Mujin-daero, Gwangju. The Embassy will render consular services including processing of passport applications and renewals, civil registrations, notarials, travel documents, NBI clearances, and certifications. Representatives from POLO and OWWA will join the consular team to provide information on labor programs and services. Additionally, applicants holding dual nationalities are also reminded to bring a copy of their Certification of Retention/Reacquisition to renew their passports. For inquiries, please contact the Philippine Embassy at telephone number (02) 796-7387 local 109 and 112.